Only for simpler understandings, the Skype for Business Client presents his own Web Browser displaying the PowerPoint Presentation. We focus here only on PowerPoint presentations in Skype for Business. In Skype for Business 2015 Server we need Office Online Server to render the PowerPoint presentation if we are initiation it using Skype for Business 2015 Clients. Once a Skype for Business 2015 user initiates or try to view PowerPoint presentation, the PowerPoint presentation file will be uploaded to the Frontend Server where the user is associated in his conference. This is in Office 365 identical with the On-Premises Skype for Business Server 2015 deployment. 2. Skype for Business 2015 Frontend Server encrypts and saves the PowerPoint file on to the Content file store (Skype for Business file share). A File ID and Access Token for the PowerPoint file uploaded is generated. 3. 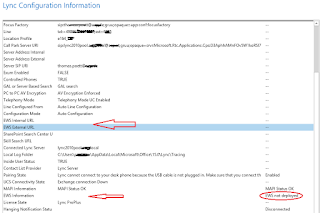 Skype for Business Frontend Server then prepares OOS URL (stored in CMS during OOS Discovery process) and forms an URL that includes, OOS Presentation URL, File ID and Access Token of the PowerPoint File. 5. Skype for Business Presenter/Attendee’s Client contacts the presented URL for Office Web App Server to get the PowerPoint presentation. 6. The Office Online Server receives this request including the Access Token, File ID and File location (file share) from the Skype for Business Clients and access the PowerPoint file by contacting the Skype for Business Content File Store via Skype for Business Frontend Server (Skype for Business Web Services FQDN will also be present in the initial Request). 7. Office Online Server makes a temporary copy of PowerPoint file on his local HDD and creates html (dochtml) file. This file is send to the Presenter/Attendee’s Client for PowerPoint presentation displaying the rendered HTML5 stream on the client. The following Office Online Server URLs are used for presenters and attendees in frame presentation. Proxy-Authorization: TLS-DSK qop="auth", realm="SIP Communications Service", opaque="D306D9C7", targetname="SN20B08FES06.infra.lync.com", crand="e0720ba3", cnum="520", response="f2285ca8e4e5bedd64f93424cb16a336f886f8d4"
Proxy-Authorization: TLS-DSK qop="auth", realm="SIP Communications Service", opaque="D306D9C7", targetname="SN20B08FES06.infra.lync.com", crand="5a8af19e", cnum="1003", response="43ebcde8b145a3b4dfbfb2649eadcc0163667c43"
Hi, we just established Skype for business with polycom video confrconfe. We test with 3 clients. One of the client share his display, it is working. Then he present PPT at the time video conference display shows "unsupported file content". Other connected user also not see the PPT presentation. What is the issue?? Hi, there might be two different issues. If you use RealConnect or any Group system, the PPTX cannot be displayed because it is rendered on the Office Web App Server and send by DHTML. So this means, it is not a video stream like Desktop Sharing. This might cause the issue. Simply try sharing the screen or the PowerPoint App directly. Hope this helps.